Please note that the information on this page is not meant to be a comprehensive treatise on phase noise. It is more of a general overview of the nature and resultant effects of phase noise in communication systems based on practical experience with real components. Many companies that produce oscillators and test equipment have excellent application note with more specific information on phase noise. Phase noise measurements quantify the short term stability of a frequency source. That is because phase and frequency are mathematically related by a differential function [ω(t) = dΦ(t)/dt] so they are directly connected. 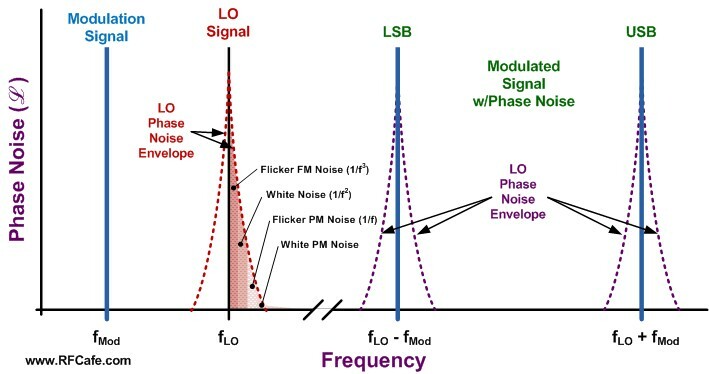 Phase noise also includes amplitude instability due to atomic scale effects like FM flicker noise (1/f3), white noise (1/f2), PM flicker noise (1/f), and possibly even voltage supply noise (typically discrete spurs). When the frequency source is used as a local oscillator in a frequency converter (up- or down-), the amount of instability (jitter) is modulated onto the transmitter or received signal (see drawing). 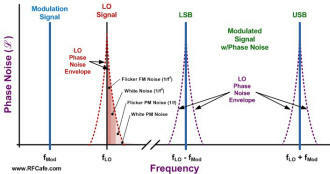 While not usually a major concern in analog systems, in high speed digital communication systems phase noise can degrade the ability of the receiver to correctly determine the difference between a "1" and a"0." That is because the "decision point" at which a circuit declares the waveform to represent a "1" or "0" can fall at a place where an incorrect decision is made. The accompanying drawing shows how a digital waveform can be distorted by phase noise during the up- or down-conversion and modulation or demodulation process. 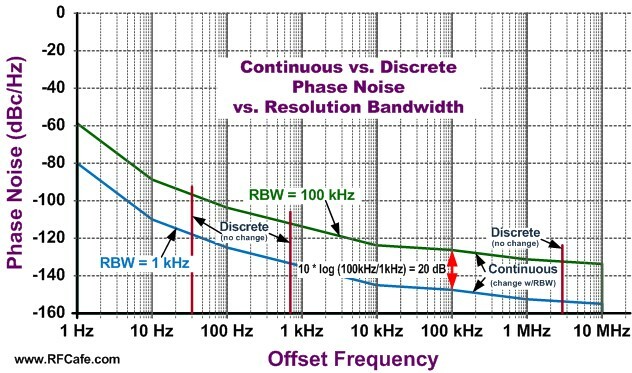 Phase noise is typically symmetrical about the primary signal (carrier) of a local oscillator so frequency and power values normally references a single sideband (SSB) in a 1 Hz bandwidth. When the reference oscillator is used by a phase locked loop (PLL) frequency source that produces an output frequency higher than that of the reference, the phase noise power levels are multiplied by a factor of 20*log (fout/fref), thereby degrading the final phase noise specifications. 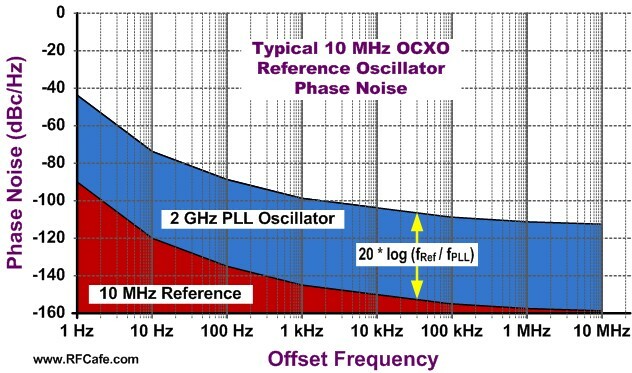 Consider a typical 10 MHz ovenized crystal oscillator (OCXO) shown in graph to the right where I plotted the phase noise of the OCXO in red and the phase noise of a 2 GHz oscillator phase locked to the 10 MHz reference oscillator in blue. You will see that the phase noise of the 2 GHz oscillator is consistently 46 dB [20*log(2*109 / 10*106)] higher than the 10 MHz reference, per the above equation. Because of the multiplication effect, many S-band and higher oscillators use a 100 MHz reference oscillator in order to gain a roughly 20 dB [20*log(10/1)] improvement in phase noise. Be aware that the equation is theoretical and that a real world PLL will add some of its own intrinsic components to the output phase noise. 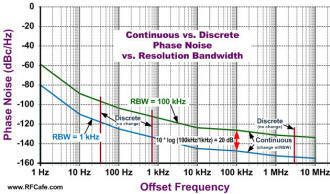 Phase noise is comprised of two basic types of frequency content: continuous and discrete. The amplitude of continuous phase noise is dependent upon the bandwidth in which it is measured, whereas the amplitude of discrete phase noise is independent of the measurement bandwidth. In fact, continuous phase noise is a spectral density function that is bandwidth-dependent. That means on a spectrum analyzer (SpecAn) display, the level of continuous phase noise will increase as the Resolution Bandwidth (RBW) setting is increased and will decrease as the Resolution Bandwidth setting is decreased. Increase the RBW by a factor of 100 and the continuous phase noise level goes up by 20 dB [10*log(100)]. Decrease the RBW by a factor of 100 and the continuous phase noise level goes down by 20 dB. However, the discrete phase noise power level does not change as the RBW is changed. That is how to discern between the two types of phase noise. See the diagram to the right. Although not an exact method, you can get a good estimate of continuous phase noise (PNcont.) in a 1 Hz bandwidth by measuring it at a wider RBW and then subtracting the decibel difference based on the ratio of the measurement RBW (RBWmeas.) and the desired 1 Hz bandwidth. Use the following equation. During my days as an engineer designing RF systems, I often needed to make phase noise measurements on synthesizers. Back in the early 1990s while working for Comsat I wrote a program in Visual Basic that automatically tested for mixer product spurs in a large batch of synthesizers for use in the INMARSAT earth station transceivers. Time was of the essence, but so was not missing discrete spurs above a prescribed level. If you are familiar with spectrum analyzers, you know that the sweep time is inversely related to the Resolution Bandwidth (RBW) setting, so a larger RBW resulted in a smaller sweep time (faster), and vice versa. The time optimization method I devised started with a wide RBW and checked across the band for violations. If none were identified, the RBW was decreased by one notch and the band was swept again. The loop continued until the noise floor was at or below the maximum permissible discrete spur level. That was the sweep that took the longest (120 seconds on the HP8568B); however, the time savings came from the fact that if a violation was detected at a wider RBW setting (shorter sweep time), the frequency and power was noted and the test was terminated, thereby not performing the longer sweeps. The following formulas are available in many textbooks and manufacturers' application notes. In reality, very few people really use the equations. Their value to most people is for demonstrating all the components that contribute to phase noise. Note: When using these formulas, be sure to keep dimension units consistent; i.e., do not mix kHz with MHz, mm with inches, etc. It is safer to use base units (e.g., Hz, m) for calculation, then convert result to desired units.